After getting a master’s in international relations, I started my career, supporting a campaign to end the genocide in Darfur. Then I helped create a nonprofit that partnered with locally-led initiatives in Rwanda to provide job training and education. One of the things I observed while I was doing this work was how fiercely African mamas worked to take care of their families and others in their community. I use mama in a broad sense: all the women who nurture, from biological mothers to young women who, as teenagers, took in smaller children after the Rwandan genocide and raised them. I felt a conviction, for lack of a better word, that the most powerful, most influential thing anyone could ever do was take care of their closest community, starting with their selves and their families, and moving out in an ever-widening circle of compassion. This shift in the way I was thinking about my work happened at the same time that I was, unexpectedly, becoming a biological mother myself. In several different ways, I moved from my “big” work to the very immediate work of growing a child. 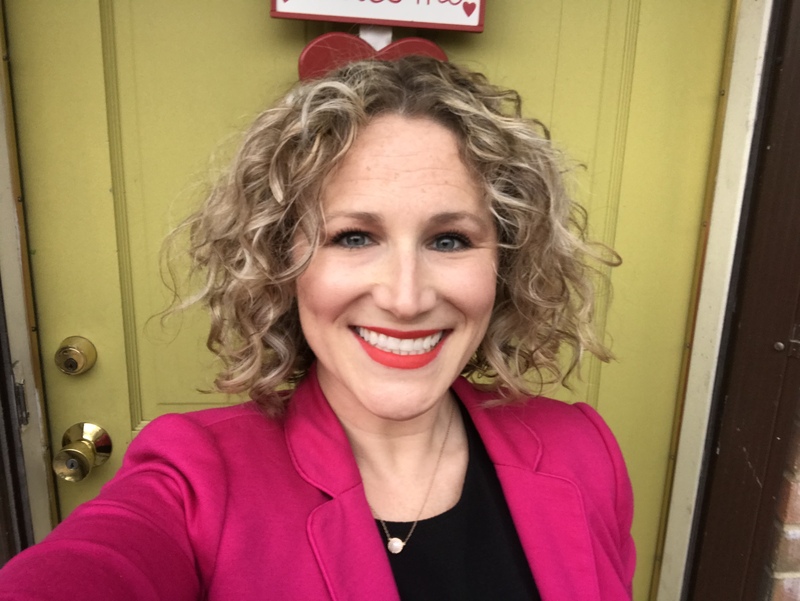 Continuing to create my life – including my career – in the years since has been a sometimes pain-staking process that has required a lot of grace (from my self to my self) and patience and trusting that if I take a step, the path will appear. I still have to trust that, every day. I want to make the world a better place. I also want to be there to pick my daughter up from the bus stop in the afternoon. The meta shift in my thinking about what it means to serve my community exists alongside the real-life practice of caring for my family. I took this photo at a conference I attended this week, to look back on as a reminder that, as difficult and scary as it can be trying to create one’s own path of career and parenting, I am incredibly grateful that I’ve been able to do what I love most, which is: first, to love on my babies, and second, to build stronger communities through health and education access. The topic of this education conference is the Future of Work. I hope to support educators preparing young people for meaningful, self-sustaining careers that allow them to be their best selves and take care of their families and communities. We all deserve that. This poem has been on my mind this week, as I did something hard, the consequences of which could not be completely foreseen. But I did it for the same reason a caged bird sings. I did it because it was the only thing I could do. I had to open the door. or you will not go through. The door itself makes no promises. I had been planning on taking my girls to the March for Our Lives in Charlottesville yesterday. On Friday night, I talked with them about what the march was about. I told the little one that there were too many guns, and we want people to not have so many guns, especially the kind that can hurt people the most. I told the older one that the right to bear arms is in the Bill of Rights, but in the context of a well-regulated militia and arms that fired at much slower speeds than arms today. I told her that her right to be alive is far more sacred. We talked about how we are asking for better regulations of guns and enforcement of regulations. Extensive and ongoing training and practice should be required for every gun owner, and we discussed that. My oldest is generally fearless. She was the toddler that made all the other moms at the playground hold their breath with how high she would climb. She has, of her own initiative, asked strangers if they will please donate to the SPCA or Dancers for Dance. Guns can take our children’s lives in more than one way. What I didn’t tell Emma was that I felt safer taking her to the march than I did dropping her off at school. Instead, I listened, and I told her that we didn’t have to go. That I’m glad she’s listening to her inner self and how she feels. There are times to teach children to do things that feel scary, but at age 9 when their life really is on the line, isn’t one of them, at least not for us. I am in awe of and encouraged by the young people who led and participated in the March for Our Lives yesterday, across the country. And I am sad that they have to march at all. I wonder how many children would like to march but are, justifiably, too afraid to do so. We certainly can’t tell them their fears are unfounded. We want them to live to be old enough to vote out of office anyone who thinks the right to bear arms is an unfettered right triumphant over all others. The girls and I still made signs, and we hung them on our front door. We talked about other things we can do to support common sense gun reform, such as donating to groups like Everytown and Americans for a Responsible Solutions, which are able to research, produce information about good policy, and lobby for it. Because kids are more important than guns. Life is more important than guns, and with the current lack of sufficient regulation and requirements for training and practice, guns are far more likely to kill us than keep us safe. 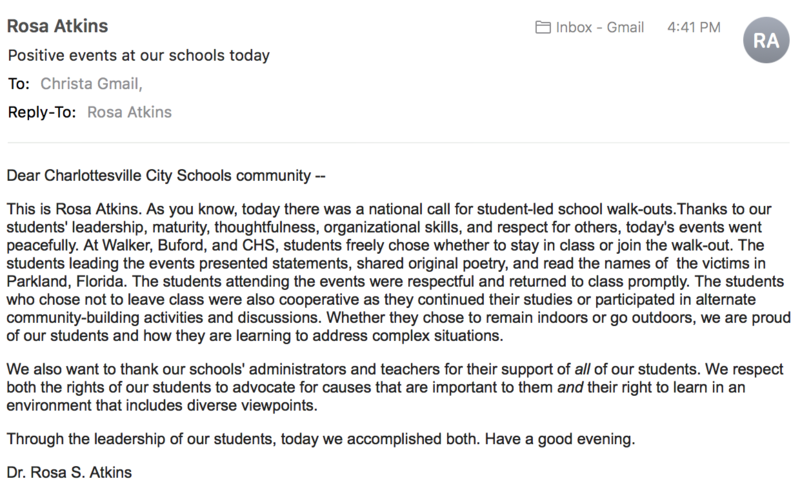 Charlottesville City Schools should be praised for their support of student-led responses to school shootings. 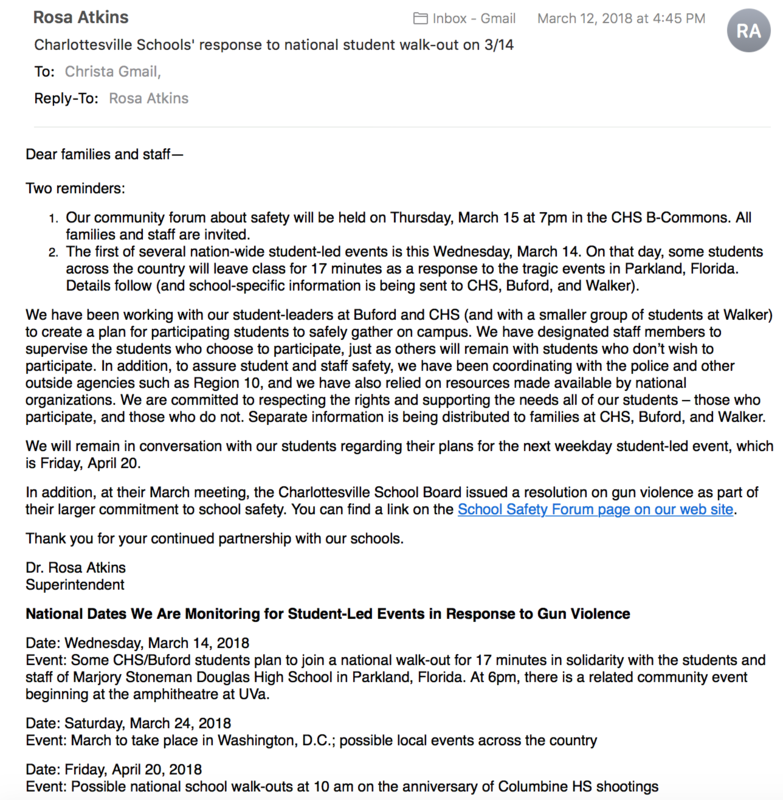 On March 1, CCS Superintendent Dr. Rosa Atkins emailed parents with information about upcoming dates when student activism would take place (National School Walkout Day on March 14, March for Our Lives on March 24, and a possible walkout on April 20: see copies of the emails at the bottom of this post). Additionally, she notified parents that a community forum on school safety will be held at Charlottesville High School at 7 pm on March 15. Thank you, Dr. Atkins, for your strong support of our students’ civic engagement. “As you know, today there was a national call for student-led school walk-outs.Thanks to our students’ leadership, maturity, thoughtfulness, organizational skills, and respect for others, today’s events went peacefully. At Walker, Buford, and CHS, students freely chose whether to stay in class or join the walk-out. The students leading the events presented statements, shared original poetry, and read the names of the victims in Parkland, Florida. The students attending the events were respectful and returned to class promptly. The students who chose not to leave class were also cooperative as they continued their studies or participated in alternate community-building activities and discussions. Whether they chose to remain indoors or go outdoors, we are proud of our students and how they are learning to address complex situations. We also want to thank our schools’ administrators and teachers for their support of all of our students. 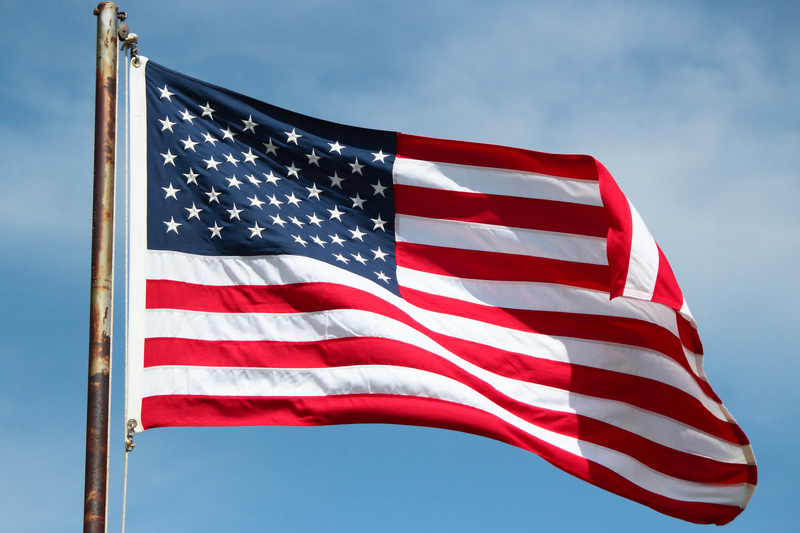 We respect both the rights of our students to advocate for causes that are important to them and their right to learn in an environment that includes diverse viewpoints. However it also turns out that I do have a yoga practice. That was on the Person I Want to Be list that I made in my early 20s. Years pass and choices are made and possibilities change. Am I still becoming the person I wanted to be? Would I trade my four year old’s pronouncement, “This is the best day of my life,” for any other award? I stand with my faith. I am glad to be traveling to Richmond with Planned Parenthood today, the 45th anniversary of Roe v. Wade. This afternoon, we will be talking with our state representatives to remind them that reproductive rights matter to us mamas, and we are watching their votes. We will also discuss how important Planned Parenthood’s services are in providing care for our community, including the most vulnerable among us.